SABIC announces an important expansion of its industry leading LEXAN™ XHR sheet portfolio for aircraft interiors today at the Aircraft Interiors Expo with the introduction of its new lightweight LEXAN XHR LIGHT sheet, including two grades, XHRL300 and XHRL200. These new offerings open further opportunities for design flexibility and weight savings, two things that are top of mind for aircraft OEMs and their tier suppliers. The new sheets comply with industry heat release, flame and smoke regulatory requirements as well as OEM toxicity standards, and are available in custom colors and textures, with excellent thermoforming characteristics that help designers achieve more distinctive interior components. “SABIC understands the need for its aircraft interior customers to not only stay ahead of design trends, but also meet the demand for lighter weight aircraft interior components that can help improve the overall fuel efficiency of the aircraft. SABIC’s durable, lightweight LEXAN XHR LIGHT sheet is a market-first solution, created to help our customers remain at the forefront of innovation in this exciting environment where aesthetics, safety and sustainability are all critical,” Kim Choate, Market Director, Mass Transportation, Innovative Plastics, said. SABIC’s new patent-pending high performance LEXAN XHR LIGHT sheet series is a complementary offering to SABIC’s LEXAN XHR sheet portfolio. It is the lightest sheet with deep thermoforming ability available today, and can be used in applications where weight reduction is desired and high impact strength is not critical. It is also the lightest thermoplastic sheet option available, regardless of base material, that meets stringent industry regulatory requirements, including heat release (OSU 55/55), flame, smoke density (FAR25.853) and toxicity (BSS7239, ABD0031). With a density of 0.94 g/cm3 and 1.07 g/cm3 respectively, LEXAN XHRL300 and XHRL200 sheets offer up to 36% and 28% weight savings respectively when replacing traditional polyvinyl chloride and acrylic blend (PVC/PMMA)-based solid sheet products. Using LEXAN XHR LIGHT sheet to replace PVC/PMMA-based solid sheet products on seat backs can help increase fuel savings by approximately $660 for each kilogram of weight reduction*. This can help each single aisle jet save up to $33,000 in fuel costs each year, based on an average plane with 150 seats. The potential savings is due to LEXAN XHR LIGHT sheet’s innovative closed cell structure, which can be thermoformed into complex 3D shaped parts with very thin walls, offering substantial potential for overall weight savings and fuel efficiency across an airline fleet. 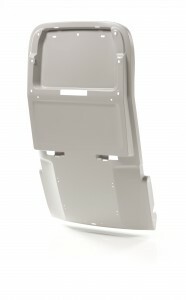 In addition to seat backs, the new solutions can be considered for interior components such as arm rests, tray tables, window shrouds, kick panels, side panels, seat trims, magazine holders, cockpit dashboard enclosures, partitions, luggage compartments and passenger service units. SABIC will present its new LEXAN XHR LIGHT sheet series, as well as numerous other innovative solutions for aircraft interiors, at the Aircraft Interiors International Expo in Hamburg, Germany, April 14-16, 2015. *Source: Composites and Forecasts Consulting, LLC. SABIC’s new patent-pending high performance LEXAN™ XHR LIGHT sheet is the lightest thermoplastic sheet option available today regardless of base material that complies with heat release, flame, smoke and OEM toxicity requirements. This aircraft seatback has been thermoformed out of LEXAN XHRL300 sheet by Big Bear Plastics Products, Ltd., one of the UK’s leading manufacturers of technical thermoformed plastic products. The use of LEXAN XHRL300 sheet for the seat back enabled a 36% weight savings (using approximately 594 grams vs. 928 grams of PVC/PMMA sheet), which equates to approximately $220 in annual fuel savings per typical seat back used in a single aisle jet 1. 1 Source: Composites and Forecasts Consulting, LLC. Saudi Basic Industries Corporation (SABIC) ranks as the world’s second largest diversified chemical company. The company is among the world’s market leaders in the production of polyethylene, polypropylene and other advanced thermoplastics, glycols, methanol and fertilizers.SABIC recorded a net profit of SR 23.3 billion (US$ 6.2 billion) in 2014. Sales revenues for 2014 totaled SR 188.1 billion (US$ 50.2 billion). Total assets stood at SR 340 billion (US$ 90.7 billion) at the end of 2014. SABIC’s businesses are grouped into Chemicals, Polymers, Performance Chemicals, Fertilizers, Metals and Innovative Plastics. SABIC has significant research resources with 19 dedicated Technology & Innovation facilities in Saudi Arabia, the USA, the Netherlands, Spain, Japan, India, China and South Korea. The company operates in more than 45 countries across the world with around 40,000 employees worldwide. SABIC manufactures on a global scale in Saudi Arabia, the Americas, Europe and Asia Pacific. Headquartered in Riyadh, SABIC was founded in 1976 when the Saudi Arabian Government decided to use the hydrocarbon gases associated with its oil production as the principal feedstock for production of chemicals, polymers and fertilizers. The Saudi Arabian Government owns 70 percent of SABIC shares with the remaining 30 percent held by private investors in Saudi Arabia and other Gulf Cooperation Council countries. SABIC’s Innovative Plastics business is a leading, global supplier of engineering thermoplastics with an 80-year history of breakthrough solutions that solve its customers’ most pressing challenges. Today, Innovative Plastics is a multi-billion-dollar company with operations in more than 35 countries and approximately 9,000 employees worldwide. The company continues to lead the plastics industry with customer collaboration and continued investments in new polymer technologies, global application development, process technologies, and environmentally responsible solutions that serve diverse markets such as Healthcare, Transportation, Automotive, Electrical, Lighting and Consumer Electronics. The company’s extensive product portfolio includes thermoplastic resins, coatings, specialty compounds, film, and sheet. Innovative Plastics (www.sabic-ip.com) is a wholly owned subsidiary of Saudi Basic Industries Corporation (SABIC).